Shawn and Angie, that is one annoying noise! Propane regulators can and do create an audible whistling or humming noise while operating. Some humming, caused by the vibration of the diaphragm inside the regulator, is normal, but not a banging or clanging noise such that you are experiencing. But the recommendation regarding WD-40 is 100% incorrect! Never spray anything into the gas regulator! Typically the noise you are hearing is not created by the regulator or the changeover valve, but rather from the pigtails that run from each cylinder to the changeover mechanism atop the secondary pressure regulator. I’m personally appalled at the quality of the propane equipment used today. Most of the components are cheaply produced, usually acquired off-shore and quite deficient when compared to the quality of the yesteryear’s products. 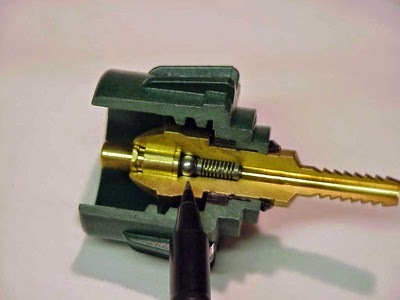 The purpose of the flow-limiting portion of the ACME connector nut is to restrict the flow of propane gas should an excessive leak exist anywhere in the propane system; it’s a safety device. Just about every time the DOT cylinder service valve is opened, this small ball bearing in the nut assembly is moved towards the piping system and into a brass seat, restricting the flow of gas. It does not, however, fully shut off the entire gas flow; the ball bearing only restricts it. By design, a small amount of gas is allowed to bypass the ball and continues to flow into the changeover valve, into the second stage regulator and then into the rest of the distribution piping system. As long as all the appliances are turned off and there are no propane leaks anywhere in the system, this small amount of bypass flow quickly builds up enough backpressure that it eventually equals the incoming bypass flow pressure coming through the device. When that happens, the small spring pushes the ball bearing back and off the seat and permits unrestricted flow of gas into the system. This whole process takes about five seconds and is designed to work in this fashion. What you are hearing is the back and forth movement of the ball bearing slamming into the brass seat inside the ACME nut of a cheaply constructed, high pressure pigtail hose. Replace the pigtails with a quality replacement hose. Avoid those cheap (by construction standards), imported hoses that most RV accessory stores stock these days. There’s an outside chance the second stage regulator is faulty too, but I’m guessing your thumping noise will go away with a pair of quality pigtails installed. To be sure the propane regulator is working properly, have a Certified or Master Certified RV service technician (not that other guy! ), run a propane regulator test, including a flow test, lock-up test and timed pressure drop leak test. Also be sure the DOT cylinders are never overfilled. But I'd wager that 90% of the time that banging noise is caused by vastly deficient pigtails.